UPDATE 11/9/17: The John Cleese event scheduled for Nov. 11 at Sarratt Cinema has been cancelled. We apologize for the inconvenience. British writer, actor, comedian, and self-described ‘tall person’ John Cleese will speak at Vanderbilt University’s Sarratt Cinema Saturday, Nov. 11. Cleese, whose iconic films include Monty Python and the Holy Grail, Life of Brian and The Meaning of Life, will address “Thinking Creatively” during the one-hour event, which begins at noon. Wood is hosting the event, which is free and open to Vanderbilt students, staff and faculty. Cleese, who was born in Weston-super-Mare, England, was headed toward a career in law when he enrolled at Cambridge University in 1960. He became a member of the famed Footlights Dramatic Club. After graduation he was hired to write jokes for BBC radio and then for The Frost Report featuring David Frost. His memorable Monty Python roles on the show included the stuffy representative of the Ministry of Silly Walks. Cleese began working on a new television program with several collaborators called Monty Python’s Flying Circus. His memorable Monty Python roles on the show included the stuffy representative of the Ministry of Silly Walks. During the 1970s, Cleese co-created the popular British television series Fawlty Towers, which featured Cleese as the high-strung innkeeper Basil Fawlty. In addition to the Monty Python film projects, Cleese earned many accolades for A Fish Called Wanda, for which he earned an Academy Award nomination as co-writer. In that film he played an English barrister who becomes involved with a pair of jewel thieves. Other notable roles for Cleese have included Q, the gadget expert in the James Bond franchise, and a ghost in the first two Harry Potter films. Cleese’s talk is sponsored by the Department of Philosophy, with support from the Berry Fund; Curb Center for Art, Enterprise and Public Policy; Department of Anthropology; Department of Psychology; Vanderbilt Brain Institute, and John Lachs. Seating is limited and on a first-come, first-served basis. For more information, email David Wood. 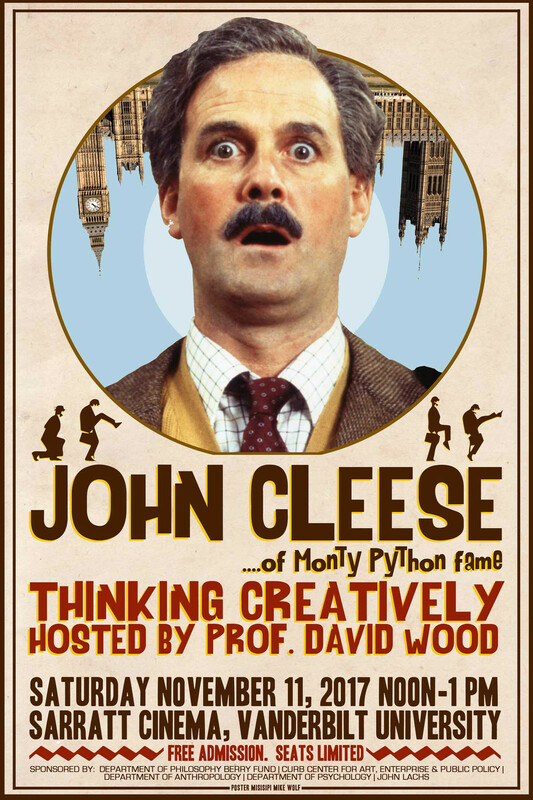 Download the John Cleese event poster.